My last post about the Henry Hudson Memorial Column got me thinking again. In everything I read about the Hudson-Fulton Celebration there seemed to be no discussion about creating a monument to Robert Fulton. It was after all commemorating both men’s achievements. Could my souvenir monument be of Fulton and not Hudson. That could be another explanation for the differences in the statues on top. Turns out, when the celebration began in 1909, a Fulton Statue already existed. Created in 1872, a Fulton statue stood in Brooklyn and while it’s not on a tall column, the figure does look similar to the souvenir. His right foot if forward, left hand it up at his midsection, right hand it up and he’s wearing a long coat. All, except that beard. That long unmistakable bead. I searched, but couldn’t find an image of Fulton with a beard. Hummm. Could this souvenir be of the Fulton statue in Brooklyn and given out during the Hudson-Fulton Celebration or is it the prototype for the Henry Hudson Statue yet to be built at that date? 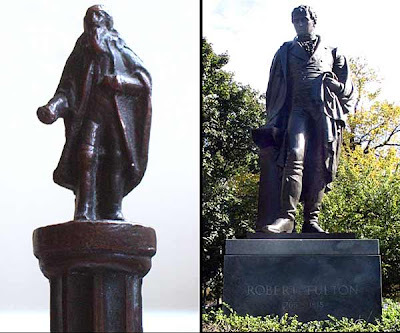 Do you know of a souevnir replics of the Robert Fulton Statue? The mystery continues. Robert Fulton (1765–1815) was an American engineer and inventor. He is best remembered for the successful steamboat North River, also known as Clermont. His invention helped to revolutionize commercial traffic worldwide. In 1872, the Society of Old Brooklynites commissioned this larger-than-life sculptural portrait of Fulton, describing him as having done “more than any other to promote and establish the use of steam in transportation of passengers and freight.” The statue, by Casper Buberl, depicts Fulton holding a model of the Nassau, the first steam ferry from Brooklyn to New York. The residents of Brooklyn Heights erected the original zinc statue of Robert Fulton near the Fulton Ferry House at the foot of Fulton Street. When the ferry was discontinued, the statue was sent to the Brooklyn Bridge Yard of the Department of Plant and Structures. It remained there until the Society of Old Brooklynites sought a new location for the monument. The Society recovered the sculpture and had it repaired and placed in Fulton Park in 1930. Then, in 1955, a new polished black granite base replaced the cast stone pedestal and the statue was replicated in more durable bronze. The original deteriorated zinc sculpture was placed in the collection of the Museum of the City of New York. I’ve heard from a few Building Collector readers regarding the Hudson Fulton Monument Mystery. Bill T said, “One possibility for the lettering on our version is that A Furst did the catering for the "Official Banquet" and the legend should have read "A Furst, caterer.” Good point. If Mr. Furst catered the banquet, he might have been in charge of having the souvenirs created. From the NY Times article about the events, "Banquets came one after the other during the gay days of the Hudson-Fulton Celebration, and it is safe to say that at every one of them each guest found beside his or her plate a souvenir of the occasion." Could the souvenirs guests found on the tables be miniature bronze monument replicas?